The area around what today is the Malheur refuge was a bit of an exception to that because of its lakes and abundant natural springs. The federal government set up Fort Harney to protect the few intrepid souls who took Donation Land Claims. Some hoped to tap the springs for irrigation, while others took “reclamation” claims to drain the lakes. No one found much success. Finally, in the 1870s, the federal government announced plans to bring railroads to places such as what today is Harney County, which would create the first viable industry for the area. The land always had been suited to cattle ranching, but with no way to ship the cows to slaughterhouses in Portland or San Francisco, ranching was a losing proposition. The railroad would change that, but would-be ranchers had another concern: the Paiute Nation. By 1870, Native Americans west of the Cascades had been confined to reservations for about 15 years, nearly always on land the white settlers did not want. Because settlers really didn’t want most of the land east of the Cascades, some tribes had not yet been contained. But with the prospect of the railroad, the Paiutes were confined to a reservation near the current Malheur visitor center. By 1878, however, settlers wanted more territory, and when some of the Paiutes participated in the “Bannock War,” the federal government closed the reservation and forced the Paiutes to journey hundreds of miles through the snow to the Yakama Nation in Washington. Some large ranchers bought parcels of the vacated Paiute land, and the vast expanse of federal rangeland was available for other ranchers to use for free, with almost no restrictions. The cattle industry took off. It wasn’t long before battles for control of the federal land became intense in central and eastern Oregon, often leading to threats, rustling, shootings, and lynchings. In the 1880s, Oregon started to create new counties in the region, hoping to bring order to the chaotic situation. Several of those counties, including Harney and Crook, adopted the names of U.S. Army heroes to honor the role that the federal government played in securing the land. Sadly, rather than stemming the violence, in some cases (most notably in Crook County but also in Harney), the prospect of legal control of federal land only increased tensions among locals; with few rules and even fewer resources with which to enforce them, control often went to the side with the most resolve to use violence and intimidation against their neighbors. Finally in 1908, the federal government stepped in to take back some control of the chaotic situation in Harney County, although not to quell violence. Instead, President Theodore Roosevelt took the almost unprecedented step of establishing a refuge for birds. By 1908, Harney County was a mess. Ill-conceived efforts to drain or divert the region’s water, coupled with destruction of rangeland by ranchers, had decimated the land. Those issues, plus the slaughter of birds to harvest feathers for the hats of the East Coast elite, had decimated wildlife in the area. By now, the federal government had by default reacquired many of the failed land and reclamation claims, and President Roosevelt declared those lands to be a wildlife refuge. The federal presence helped to control battles over the land, and Harney County settled into relative calm. The county then enjoyed its greatest growth spurt ever. When the refuge was created, Harney had about 2,500 residents. By 1930, the county had about 6,000 residents (compared with slightly more than 7,000 today). The Eastern Oregon Land and Livestock Company had acquired thousands of acres of rangeland, and a slaughterhouse opened to sell beef to all of the newcomers. Then the Great Depression hit. Farmers and ranchers across the country saw demand for their products plummet, but those in arid lands, such as Oklahoma and Eastern Oregon, were hit especially hard. Soil and water conservation were concepts that few farmers understood, and harmful practices in fragile ecosystems had created an environmental disaster. Farmers and ranchers pleaded with the federal government for help. At first, that help came in the form of advice, which many farmers and ranchers heeded. Contour plowing, rangeland management and other techniques became common practices, but not common enough. As farmers today can attest, even the best practices of one farmer can come undone under the bad practices of neighbors. Farm bureaus and others sought laws to enforce best practices. In the case of Harney County, the most-significant of those laws was the Taylor Grazing Act of 1934, which for the first time codified the use of federal land for grazing. The Taylor Act went a long way toward curbing abuses of free federal land and saving the livelihoods of independent ranchers, but did little to help corporations such as the Eastern Oregon Land and Livestock Company and the local slaughterhouse, and nothing to help the people who worked for those companies as laborers. Again, pleas went out to the federal government. By now, President Franklin Roosevelt’s “New Deal” had many programs in place to answer such requests, but Oregon found itself in a difficult position. Its new Governor, Charles Martin, was a Democrat just like Roosevelt, but he also sympathized openly with Adolph Hitler and the American Ku Klux Klan and reviled New Deal policies as “Bolshevik,” hindering recovery efforts in Oregon. When Oregon thrashed Martin in his 1936 re-election bid, the New Deal aid spigot was opened to Oregon. Some of the most famous results of that aid are Mount Hood’s Timberline Lodge and the bridges along the Oregon Coast. Lesser-known examples include pavement along the Tualatin Valley Highway between Beaverton and Hillsboro, and electricity to rural communities. Sparsely populated Harney County hardly represented a blip on the radar screen, but it hardly was forgotten. The federal government bailed out the Eastern Oregon Land and Livestock Company, buying its land at above-market rates. It did the same for the failing slaughterhouse. Then the Civilian Conservation Corps established a camp on that land. In the county of 6,000 people, the CCC alone hired 1,000 to improve grazing opportunities and to build better facilities on the Malheur refuge. For the past 80 years, Harney County ranchers have enjoyed extremely low-cost access to federal land, in addition to in some cases hundreds of thousands of dollars in direct federal taxpayer subsidies. 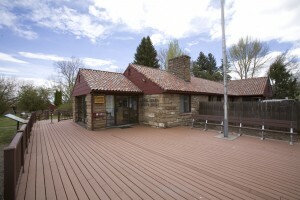 One of the few tangible reminders of all of that federal aid in Harney County is the Malheur County National Wildlife Refuge visitors center, which anti-government militants occupied at gun point, citing it as a symbol of government overreach.